The web site you're visiting right now has a long (and storied!) history. While not as long as some, it's certainly long enough at fourteen years (as of 2015) and counting. Like many people, I started out hosting my web pages on space provided by a long since defunct Internet Service Provider. These were the times of dial-up for most people, and so it was that running my own server was almost totally out of the question. I didn't have the benefit of a dedicated phone line. It was a workable enough arrangement--my web site was more than small enough to fit within the allocation of space I had--until the server backing up every customer's web publishing space crashed. It was never restored to availability. Just having dial-up access to the Internet that was available as a local phone call was a miracle. Always-on broadband service couldn't even be imagined, but it finally did come along and I signed up quite readily. Around that time I got to thinking how nice it might be to manage my own web server. There'd be no one telling me how much storage I could have and as a result, no web page or other resource too ridiculous or mundane for publication. My personal web site and server first came into existence in the early 2000s. Back then, the needed dynamic hosting services were provided by Dynamic DNS Services (DynDNS). DynDNS eventually changed their business model, making it impractical to continue utilizing their services. Ultimately, they got out of the free dynamic DNS service market entirely. This site moved to its present location in the mid 2000s, and its dynamic DNS services are now provided by afraid.org, on their mooo.com domain. I'd readily recommend their services to anyone who is in need of a reliable DNS registration provider, for either dynamic or statically located systems. Over the years, a number of different computers have provided the platform upon which this site resides. All but one of them have succumbed to eventual hardware failure. The one that didn't suffer hardware failure fell victim to a disaster created by the extremely negligent behavior of my hometown in maintaining their sewer system. The one true piece of server-grade hardware used to host this site, Greyghost was the original computer behind this site. If memory serves, it went online sometime in late 2001 and ran until mid-2002 when an array failure took it offline. Initially this failure was pretty well terminal and the machine was shelved. During that time there was no Greyghost site. Greyghost did go under in the flood mentioned below, but since it was not plugged in and powered, all that had to be done was to clean out the yuck from inside and to replace the ruined clock battery. All the hard disks inside were totally waterlogged and discarded, but the hope is that someday the original 'Ghost will come back. The name "Greyghost" comes from a few places. It primarily comes from watching too many afternoon cartoons in my youth. As I remember it, the Batman animated series of the 1990s featured one episode with a retired hero character known as the "Grey Ghost". (It's possible that the spelling differed.) Somehow, throughout all of the intervening years, the name stuck in my memory and it seemed fitting to apply it to this computer. For a server, it was amazingly quiet and cool running. Around 2010 or so, plans were made to try and put this machine back online and into the capacity of hosting this web site. 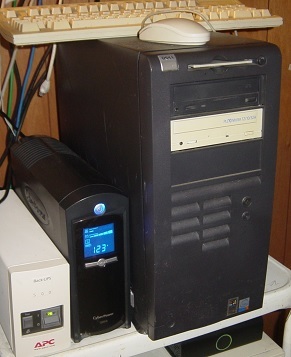 Although the system itself was successfully revived, the storage subsystem proved to be every bit as troublesome as it had been back when this computer had been in regular use. The biggest problem proved to be one of unreliable power delivery over the "Type II" SCSI backplane boards used in this system. Plans were made to replace these with a directly run cable and much newer SCA hard drives with 68 pin SCSI adapters, but they never materialized and the restoration was stopped. The system remains in storage to this day. A lack of support by modern operating systems only served to further complicate matters. Microsoft gave up Microchannel bus support by the time of Windows 2000 and while the exact time is unclear, Linux eventually followed suit. Something like NetBSD may well run on this system, although I have never tried it. With Greyghost down for the count and showing no sign of making a recovery in the limited time I could devote to get it running again I chose an IBM PS/2 Model 65SX to act as the webserver behind this site. This was done mainly for entertainment value. I didn't expect it to work all that well, but it did. It was surprisingly stable and reliable, if slow. I made no secret of the machine's hardware configuration so that world would know just how useful old computers remain to this day. This machine ran from the end of 2002 until May of 2004 when the sewer outside my home collapsed. This filled my basement with filthy water. While provisions for the machine to stay out of a few inches had been made, the 34 inches of water that ended up in my basement covered the machine anyway. When the water went down, it was discovered that the Model 65SX was pretty well destroyed. Circuit board traces were burned off, the power supply was shot, massive corrosion covered all parts of the machine and both hard disks were waterlogged beyond all hope of repair. I salvaged what could be saved from the machine and discarded the rest of it. This was truly an unfortunate ending...the Model 65SX had some very impressive/rare components and having been owned by an ex-IBM employee, it also had unique programs and files on it as well. Shortly after the flood went down, and the power was turned back on, I found that despite being quite filthy, my cable modem still worked! It was at this point that I decided to get a server up as quickly as possible and start restoring the contents. I didn't know how I was going to do this, but my dad bought the Dell at a garage sale for $50. 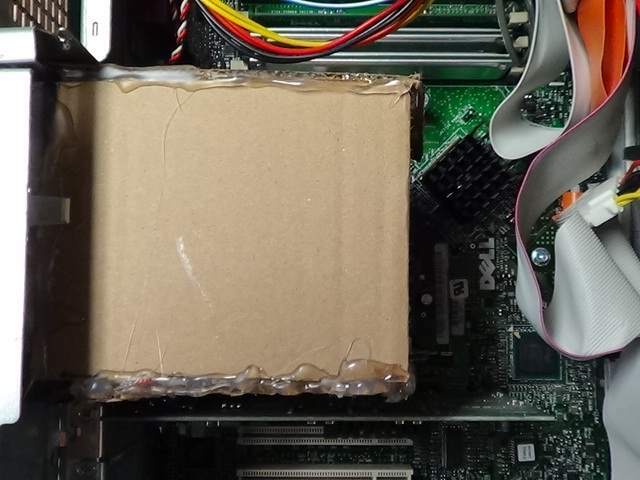 Being nearly the only computer I had left after the flood (the others being my LTE 5000 and an HP Vectra VL Pentium II 300 MHz powered tower) I made it into a webserver. While the hard drives from the Model 65SX were ruined, and my backup tapes had gone underwater as well, one of my brothers had mirrored nearly everything from the previous server. What an amazing turn of luck! It was certainly a welcome departure from my usual kind of luck. Almost all of the materials that had been online previously were restored to availability. They remain online to this day. This server started out working in my bedroom and was later moved to the basement after enough of the flood mess was cleaned up to make it usable again. This time around, though, it found a place where no flood will get it, high off the floor. Unfortunately, disk hardware failure spelled the end of this computer's time in the limelight. Before restoring the contents of the previous web server to it, I needed to secure more disk storage. That came in the form of a Maxtor 6E040L0 drive, before I came to realize what utter garbage almost every Maxtor hard drive was. This system is still around. I had some plans to place it back into service after reparing all of the fallen hard drives. Now it is unlikely that this will happen. Drive bays were always at a premium in this system and its temporary replacement had quite a few more to offer. So it was that the devil bit me and I set up a RAID1 disk configuration in the Optiplex GX400 after the bridge chip in the USB attached Western Digital My Book hard drive gave it up. During the time that I've had this web site, its usage levels and importance have increased over the years. When the Dimension L550r finally broke down "for good", I hastily grabbed this system out of storage and set it up to become my active web server. I bought this computer and several just like it at a surplus auction for a few dollars apiece. 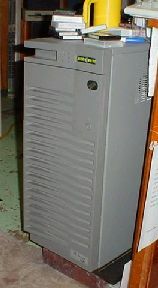 It's one of those early Pentium 4 computer systems that features the soon abandoned Socket 423 design and the very unpopular Rambus RDRAM. Luckily, most of these came with a decent amount of installed RAM, and with a little shuffling, all of them had more than enough to get by. A thoroughly unexciting Pentium 4 clocked at 1.4 GHz is the power plant within this computer. It seems to get the job done. So far, this system has suffered a failure of one RAM socket that, due to the serialized layout of RDRAM, seemed like it might be the end of the line for it. Luckily, moving the continuity RIMMs around such that one of them was in the troublesome socket seems to have solved the problem. How long will it last? I don't know. Hopefully it will end up lasting a good long time. Other failures to date have included a power supply (amber light of doom), and the CPU/case cooling fan. While it seems that the JMC/Datech fans Dell once used will steadfastly refuse any lubrication to quiet their bearings, they appear to be capable of running for ages despite putting off a terrific racket. And so this one does. I doubt the furnace standing across from this computer cares very much. This computer might well want to die, but I refuse to let it. I don't know about you, but I consider that to be an excellent selling point. This site has been a purveyor of the hard to find and a place to publish technical articles and resources both public and personal for many years now. It has grown exponentially over time and caters to a wide audience of technically inclined people. One of the most popular resources (at least judging by the amount of spam I get concerning it) is the Sci.Electronics.Repair FAQ mirror. Another popular resource is the IBM PCCBBS mirror. You'll find a lot of links pointing to these and other parts of this site in the online world, particularly in the vintage computing and electronics hobbyist circles. While I'm relieved beyond belief that all of this has blown over with seemingly little damage to anyone's reputation, I have been left disappointed in such organizations as the Electronic Frontier Foundation. Initially contacted by a member of their counsel, I heard nothing after that intial contact and can only presume that they were either unable to follow this matter up or unwilling to do so. For as long as I've got any say in the matter, I plan to keep this web site, the server and everything hosted here online. I haven't yet managed to build or house any of these systems in a proper commercial data center environment. Each one lives off of my home-grade Internet connection and that's been the case for all of the years that this site has been online. It's quite possible that at some point I might have to locate a new dynamic DNS provider, so this site's name might change. Maybe one of these days I'll register a proper, top level domain name for it. Please don't mirror anything large from this site without first asking! (This means, but is not limited to, the PCCBBS mirror.) Such activities are likely to unfairly capitalize on the bandwidth I have got, and cause me to become annoyed. Likewise, don't link to this site from any sort of high volume site like Slashdot. If you ignore this warning, you are taking the very real chance of having your access to this system rather severely curtailed. So don't do that. If I ever do find myself with the use of a proper data center and actual bandwidth, the hosting environment will undoubtedly become a lot more professional. Those of you in the viewing audience who have read down this far might be planning to ask why I haven't considered building a proper server to host this site. Well, old hardware is cheap, easy to come by and suits my needs pretty much perfectly. I'm a big believer in doing what works and is paid for, rather than rushing out to spend money I don't necessarily have on the newest and greatest. Maybe if and when whatever computer is currently being pressed into service pops its clogs and I have to replace it, I'll give some thought to building something around a low power usage motherboard. Intel's Atom processors were for a time enormously popular and came to be much better than they were when they first hit the market. If I'm feeling really adventurous, I might even try something like a Raspberry Pi board. It's hard to tell just where things might end up.